Thanks so much to everyone who left a comment for the giveaway! It was rather fun reading how much everyone loves alpacas. I haven't had much real-life exposure to them, but my friend's enthusiasm was enough to inspire me to design one. Congratulations! I think I even still have your email, so I'll be sending a copy of the pattern to you as soon as I'm done here. For those of you who might still like the pattern, it is available on Etsy and Ravelry. 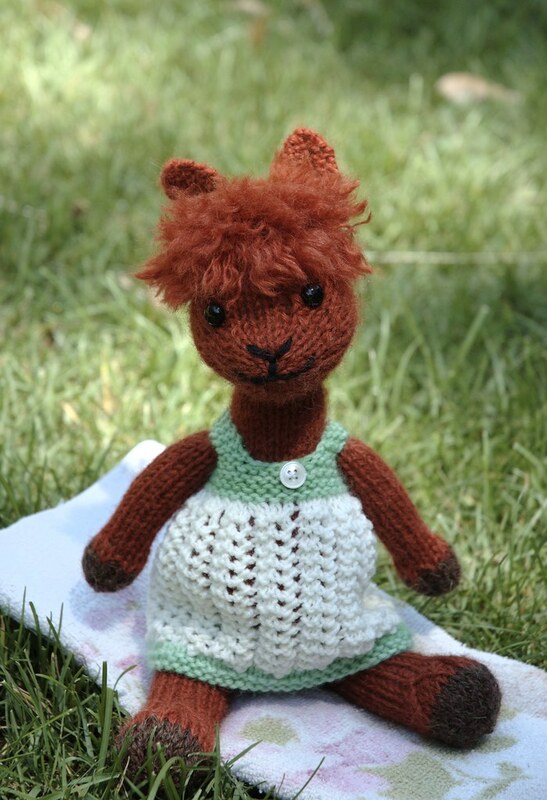 I can't wait to see other knitter's alpacas turning up on Ravelry! Posted by Barbara Prime at 10:19 a.m. Although I am a sullen and rotten loser, I'm very glad Melanie won this pattern, especially because she thought the hair was the most endearing feature, because that observation endeared her to me. I am beginning to think that random generators, not just Blogger alone, hate me and eschew me. A dismal thought. But, oh, well. I get to read your blog, that's prize enough. August 9, 2010 at 1:09 p.m.
August 12, 2010 at 12:10 p.m.